Bronchitis is a term that means inflammation of the bronchi in the lungs. The bronchi are air passages that connect the windpipe (trachea) to the lung tissue. When you have bronchitis, the inflamed lining of your airways (bronchi) secretes excess mucus, causing a cough that is productive of phlegm, or sputum. Acute bronchitis (short-term bronchitis) is usually caused by a viral infection such as cold or flu. Acute bronchitis commonly affects people in winter. Acute bronchitis is usually a mild illness, and most people recover in a few weeks without any specific treatment. Acute bronchitis often starts with similar symptoms to that of a common cold — tiredness and a sore throat — then a cough develops. The cough is often dry at first but later on becomes productive, with white, yellow or green sputum (also called mucus or phlegm) being coughed up. While most symptoms usually get better within about 2 weeks, coughing can sometimes persist for up to 8 weeks. Older people, people who smoke, or those who have heart or lung disease are at higher risk of complications such as pneumonia. Acute bronchitis is usually caused by a viral infection, such as cold viruses or influenza virus. Sometimes the cause is a bacterial infection. Bacterial infections can develop following infection with a virus (this is known as a secondary bacterial infection). people who are smokers and those who are exposed to smoking at home. Your doctor will ask about your symptoms and perform a physical examination. 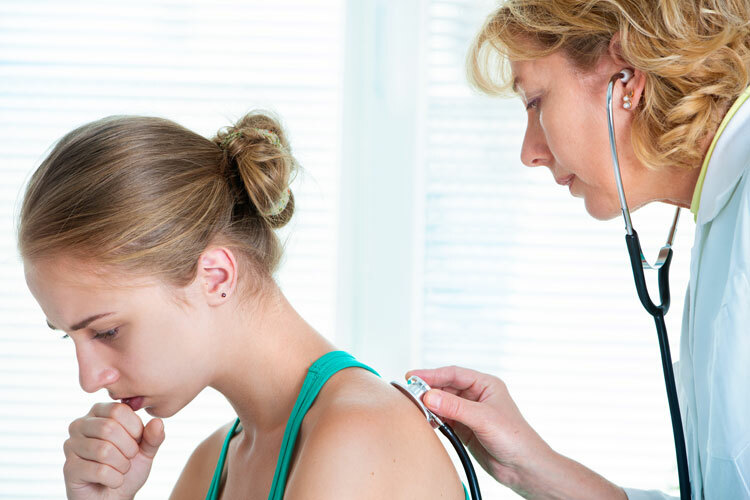 While most people with acute bronchitis get better within a few weeks, your doctor may recommend the following tests if your symptoms persist or get worse. Chest X-ray to ensure you haven’t developed pneumonia, which can be a serious complication of acute bronchitis. Sputum sample: Your doctor may recommend testing a sample of the mucus (sputum) you are coughing up for a bacterial infection. Spirometry (lung function tests) may be recommended to check the state of the airways and how well your lungs are functioning. Throat swab – to test for possible causes of acute bronchitis, such as influenza. you have pre-existing heart or lung disease (such as heart failure or asthma). Most people recover from acute bronchitis with self-help measures within a couple of weeks. take medicines such as paracetamol to reduce pain and fever. Most cases of acute bronchitis do not require antibiotics. However, if you are coughing up lots of yellow or green sputum, you have a high fever, or you are particularly unwell, your bronchitis may have a bacterial cause. In this case, your doctor will prescribe antibiotics. One of the most common causes of acute bronchitis is influenza (the flu), so it’s a good idea to have an annual influenza vaccination. Immunisation is usually recommended in autumn, so that you are protected over the winter flu season. Pneumococcal vaccination is also recommended for some people. Being immunised helps protect against several strains of pneumococcal bacteria that commonly cause pneumonia. See your doctor about which vaccines are appropriate for you and whether you are eligible for free vaccination under the Australian National Immunisation Program Schedule. It’s also important to reduce exposure to smoking. Stop smoking if you are a smoker, and take steps to avoid passive smoking. Chronic bronchitis is the term used to describe bronchitis that goes on long-term. The coughing and mucus production can last for months and keep recurring, often lasting longer each time. Chronic bronchitis is defined by doctors as a cough that is productive of sputum occurring on a daily basis for at least 3 months of 2 or more consecutive years. Chronic bronchitis is usually caused by smoking, but can also result from inhaling substances that irritate the lungs, such as chemical pollutants and dust. Often, continued exposure to the irritant can lead to progressive worsening of the condition, and inflammation and scarring of the small airways make breathing more difficult. Emphysema may develop — this is when the irritants also cause destruction of the alveolar air sacs. This makes it hard for the lungs to support any kind of exertion without the person becoming breathless. Bronchitis and emphysema may occur separately but often occur together as part of an illness called chronic obstructive pulmonary disease (COPD). COPD usually affects people older than 35-40 years of age, but is often not diagnosed until people are in their 50s. There are several options your doctor may recommend if you have chronic bronchitis or chronic obstructive pulmonary disease (COPD). Giving up smoking will slow the rate that the disease progresses and should improve your symptoms. This is by far the most important thing you can do to help if you are a smoker. Medicines can be used to relieve symptoms, prevent flare-ups, and improve lung function and quality of life. They are often taken in the form of an inhaler. Antibiotics are commonly prescribed to treat flare-ups in people with chronic bronchitis. Pulmonary rehabilitation programmes are designed to help improve symptoms and quality of life for people with COPD. An annual influenza vaccination can prevent you from catching influenza in the winter, and is recommended for people with COPD. Vaccination against pneumococcal disease is also recommended. 1. Centres for Disease Control and Prevention (CDC). Bronchitis (chest cold) (updated 17 Apr 2015). http://www.cdc.gov/getsmart/community/for-patients/common-illnesses/bronchitis.html (accessed Mar 2016). 2. Cough (revised February 2015). In: eTG complete. Melbourne: Therapeutic Guidelines Limited; 2015 Nov. http://online.tg.org.au/complete/ (accessed Mar 2016). 3. NHS Choices. Bronchitis (updated 14 Jul 2014). http://www.nhs.uk/Conditions/Bronchitis/Pages/Introduction.aspx (accessed Feb 2016).